While the Palm 700p has an SDIO slot, it doesn't yet support Wi-Fi via SD, which means that an external "sled" would be needed to use Wi-FI. This coupled with the slow Bluetooth speed means that it will be hard to move files on and off without resorting to sneakernet + SD cards or a USB cable. There's no announcement yet about a UMTS/HSDPA Treo 700p, but this makes some sense when you consider there are no HSDPA phones available yet; UMTS is roughly 50 percent slower than HSDPA. Why release a device that can use the fastest network available? It would be a little odd on the marketing side. UMTS and HSDPA work worldwide, where EVDO is more of a South Korea/United States standard, which makes it clear that Palm needs to release a UMTS/HSDPA Treo eventually, but they might wait until they can have one that includes all the worldwide radio bands for those standards. Sprint Nextel and Verizon Wireless will sell the handheld/phone, but pricing and availability aren't yet announced. The thing is, as just about anyone who has used a pocket pc on evdo will tell you, evdo performs fast enough for just about any purpose you'd use a ppc for that you NEVER use the wi-fi anyway! I wouldn't miss it if it were removed from my PPC6700. gf: uploads? maybe I'll send a photo from the camera part of the phone once in a while. But more likely you'll wait till your at your desktop to process your pix and do anything sophisticated. What else am I really going to use uploading for on a phone? Likewise, you don't wind up cruising heavy sites from your phone either, you wait till you're back at your desktop. Sling media on the phone is a great example of a super impressive app-- the speeds are more than adequate to support a 2 or 3" diagonal video feed. It all really is a matter of tech spec numbers vs real-world use. Once you use these things heavily, your usage adapts and you realize what you need vs what you thought you couldn't do without. Love WiFile on the Treo 700p. I can get to my .mac accounts, but would reallly like to see one more possibility. My family shares a calendar, but on iDisk addressess seem to be the only .mac access. How hard to add the ability to get to the calendar, and document forlders for syncing a bit eaisier in the mac Sync approach. That way if I post a calendar even to my Treo, when I sync up via my Mac .mac account, it's on there! Let me know if I'm overlooking something, but making it more transparent like the mac would be SO cool. 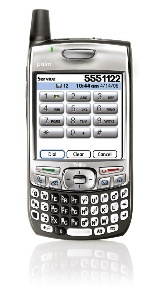 I am spinning my wheels trying to find out if there is a wifi adapter available somewhere for the Treo 700P. Can anyone let me know if I am wasting my time and that it is impossible for the 700p to be wifi capable?